I will be combining my YA and adult reading and purchases on this one weekly roundup. We were supposed to get a bunch of snow to begin this past week. What we actually got was about 2 inches of heavy, very wet snow and 0.2 inch of ice. Then cold temperatures arrived making walking and driving very hazardous. I went out on Wednesday and had trouble getting back up my driveway. My brother sanded and salted and that worked. Now, I can get in and out again. I had company from Thursday evening through Sunday which cut down on my reading time but it was wonderful to catch up on my friend's life (beyond what I see on Facebook). She's a crafter so we made a visit to a local yarn store so that I could buy her a Christmas present that she could use. They have an amazing assortment of yarns. It almost makes me want to take up crocheting as a hobby. This coming week should be nice and quiet again. The weekly forecast has cloudy skies, temperatures above normal, and less than a 20% chance of precipitation. I should be able to get out and exercise every day. The Invisible Ring by Anne Bishop (Mine) - Prequel to the Black Jewels series when there is still some resistance to Dorothea and Hekatah's goal of controlling the world. My review will be posted on Jan. 27. The Antidote by Shelley Sackier (Feb. 5) - YA fantasy that was complex to the point of confusion. My review will be posted on Jan. 31. The Military Wife by Laura Trentham (Feb. 5) - Excellent romance with great characters. My review will be posted on Feb. 2. Dreams Made Flesh by Anne Bishop (Mine) - Four stories in the Black Jewel World. My review will be posted on Feb. 3. Tangled Web by Anne Bishop (Mine) - Book 6 in the Black Jewels series is the story of some of the characters getting caught in a deadly "Haunted House." My review will be posted on Feb. 10. The Shadow Queen by Anne Bishop (Mine) - Black Jewels Book 7 moves much of the action to the devastated land that remains after the defeat of Dorothea and Hekatah. A Queen needs to convince the remaining Warlords to give her a chance to make things better. My review will be posted on Feb. 17. Shalador's Lady by Anne Bishop (Mine) - Black Jewels Book 8 is a direct sequel to Book 7. Lady Cassidy is in a competition with Lady Kermilla to rule in Dena Nehele which almost brings the country to war. My review will be posted on Feb. 24. Twilight's Dawn by Anne Bishop - The most recent in the Black Jewels series is an anthology of four stories. Other than reading, crochet is my favorite hobby :) I love yarn shopping! We got about 5-6 inches of snow here in southern PA. Have a great reading week and thanks for stopping by! I need to get a copy of The Gilded Wolves. I wish I could crochet but I got very confused when I tried to learn. I've crocheted a bit. It's fun, but I don't have the patience for big projects. Have a great reading week. Stay warm and dry! The snow is bad enough, but ice on top is the worst! I love yarn shops, but haven't done any knitting in years... keep saying I want to start again. Hope you have a good week, happy reading! It's very cold here and we are supposed to get snow at the end of the week, but they aren't sure yet. The Military Wife has my interest. I'll have to check that one out. We had snow, but no ice -- thankfully. I have Gilded Wolves on my list. Nice! Haven't read that series by Anne but love The Others! 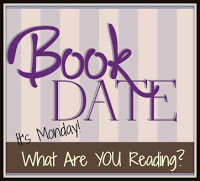 Hope you enjoy this week's reads!! We're supposed to get snow too but so far we haven't had that much (knocks on wood). Say You're Sorry is one I'm curious about. We're expecting a week of rain. As always you have a delightful selection of books. My weekly update. Glad you had a nice time with your friend. Hope this week is filled with plenty of reading and whatever exercise you choose! It has been so cold here, but not snow. Glad you're able to get in and out now. Looks like Anne Bishop is going to be with you for a bit. I hosted The Military Wife on my blog. Hope you have a great week. Thanks for visiting my blog today. You seems to be a boor worm, such many reviews. I'm gonna to read The Gilded Wolves in the nearest future! Glad you had a nice visit with your friend. That certainly looked like an Anne Bishop binge. I liked the look of The Blood Spell. Hope you had a good week of reading. How lovely that you got to visit with your friend. That's such a blessing. Glad you're safe from the ice. It really can be scary!